The Best Fruit Salad Recipes for kids are one they will eat, am I right? 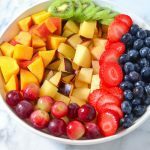 Easy Fruit Salad recipes are the best for kids. Chop up big fruits into bite size pieces.